An Enduring Power of Attorney (EPA) is a document that gives another person the power to make personal and financial decisions on your behalf. It is legally binding if you lose the capacity to make decisions yourself. A specific form must be signed by yourself and the attorney outlining the types of decisions the attorney is able to make on your behalf, and other details relating to the exercising of power, in order to grant an Enduring Power of Attorney. 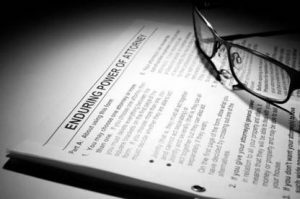 Why give an Enduring Power of Attorney? As you will not always be able to make decisions when you need to, an Enduring Power of Attorney is extremely important. An Enduring Power of Attorney is needed when your health circumstances change and you become disabled or ill and are unable to make decisions yourself. A Power of Attorney will ensure that the person you nominate can take care of your affairs, and act in your best interests. What types of decisions my attorney can make? Your attorney has the power to make decisions regarding your personal and health matters (including day to day issues as to where you live, diet and health care etc) and any financial matters (including banking, investing money, etc). This is why it is important that you choose someone you can trust such as a spouse, family member or close friend who you feel has your best interests at heart, to make the decisions required on your behalf. You are also able to appoint more than one attorney if you wish to do so. What are the Powers of the Attorney? You can specify and restrict the type of decisions that you want your attorney to make on your behalf. These must be clearly outlined within the Enduring Power of Attorney document. You are also entitled to revoke the Power of Attorney at any time so long as you are capable of understanding the decision that you are making. What are my attorney’s responsibilities? Your attorney’s responsibilities are very clearly set out in law. The law ensures that your interests are paramount and that your wishes are respected. If someone close to you believes that the attorney is not acting in your best interests, they can make an application to the Guardianship and Administration Tribunal, or to the Supreme Court. The attorney can then be required to provide a detailed account of all financial transactions and any decisions that have been made on your behalf. The Court and Tribunal have the power to remove the attorney and appoint a new attorney to act in your best interests. What happens if I do not have a Power of Attorney? If you do not have an enduring power of attorney and lose the capacity to make decisions on your own behalf, the government can step in to take responsibility for these decisions. This may include the Public Trustee and the Adult Guardian. An application can also be made to the court or the Guardianship and Administration Tribunal in these circumstances to appoint an attorney to represent you. Do I or should I pay my attorney? You do not need to pay your attorney(s) for the Power of Attorney to be effective. Generally, payment is only made when a trust company or other professional person/organisation is acting as your Attorney. When does my attorney’s power begin? A Power of Attorney can start on a date specified in the document or upon the occurrence of an event (such as disability or incompetence). If you have not specified a date or event, a Power of Attorney starts immediately upon execution. The Enduring Power of Attorney for health matters only begins when you lose capacity. How much control will my attorney(s) have? You are in full control over your affairs as long as you have the capacity to make decisions, and understand your decisions. How long does the power continue? Different time spans are set for personal and health matters, and financial matters. For your personal and health matters, it continues as long as you are incapable of making decisions or under the effects of a decision you make. For your financial matters, it stays in effect for your lifetime or until it is revoked. Is there anything else that will end this power? If you haven’t created an Enduring Power of Attorney, now is the time to do so. Unexpected changes in your health and personal circumstances means you may lose capacity to make decisions on your own behalf. Please contact us to help you through this complex area of law.